Before sunrise, about 26 fishermen board their motorized boats and head out to deep water where the dolphins migrate. The dolphins have been using these migratory paths for thousands of years, and the hunters know exactly where to find them. When a school of dolphins swims by, the fishermen position their boats one behind the other, perfectly evenly spaced. Then they lower several stainless steel poles into the water, one on each side of each boat. The poles are flared out at the bottom much like a bell, which amplifies the sound produced when the hunters repeatedly hit the poles with hammers. The noise creates a wall of sound underwater, and the dolphins suddenly find themselves trapped between this wall of sound and the shoreline. Trying to get away from the sound, the dolphins swim in the opposite direction, toward the shore. 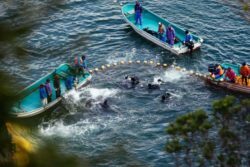 The dolphins’ panic and loss of navigational sense enable the fishermen to drive them into a small, hidden Cove near Taiji harbor. The fishermen seal the mouth of the Cove with several nets, and the dolphins are trapped. How do they kill the dolphins ? The Taiji Dolphin Killers herd the trapped dolphins into shallow water, close to the rocky beach. 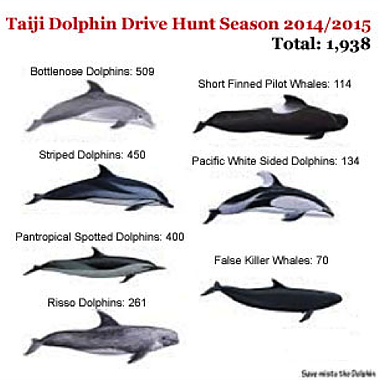 Here, they kill the dolphins with long, sharp spears. Often times, they stab the dolphins with sharp fishermen’s hooks and haul the still living dolphins onto their boats. The cruelty is enormous. The dolphins thrash about in their own blood, and the air fills with their screams. This killing, called “humane” by government bureaucrats, has been documented by the Academy Award winning documentary, The Cove. Since The Cove came out, the fishermen have altered their killing methods. The fishermen pull dolphins underneath an array of plastic tarps (set up to prevent from filming the slaughter). There, the killers push a sharp metal spike into the dolphins’ necks just behind the blowholes, which is supposed to sever the spinal cord and produce an instant “humane” death. The fishermen even push wooden corks into the wounds to prevent spilling blood into the Cove, again to prevent the filming of blood-red waters.